For nearly 70 years, the traditional drug development model has been one in which large pharmaceutical companies operate largely in-house: conducting all R&D, building their development pipeline, clearing regulatory hurdles, and bringing life-saving therapies to market. Today, the world of drug discovery has shifted, and it’s vaster than it’s ever been. For players in high-tech, biopharma, and med-tech who recognize that ideas and innovation can — and should — come from anywhere, pursuing the concept of open source innovation has proven a worthy one. In fact, this model has helped bring forward more than 50 percent of all new medicine discoveries[i], meeting significant unmet need and helping more people live healthier lives. External sourcing is leading biopharmaceutical innovation, transforming R&D, and disrupting the industry — and it shows no signs of slowing down. The new model works by identifying the most promising drugs and advancing them at a more efficient and rapid pace. By leveraging an “open source” community of scientists and innovators, the model brings together new and potentially ground-breaking ideas, discoveries, and therapies with a high likelihood of success. It’s not at odds with traditional R&D but rather, it is an alternative that works either alone or in tandem, to drive efficiency and have a larger impact overall. This way of thinking fills a void in the marketplace because the amount of R&D global pharmaceutical companies can execute on their own is small compared to what can be accomplished when ideas are sourced from multiple places, Nicholson explained. The approach also benefits the innovators who lack the infrastructure to bring their products through expensive late-stage clinical trials, the commercial presence to both meet the needs of patients and providers, and the combination of the two to recoup their R&D investments — an expenditure that reached $50 billion in 2015, according to a report by the Pharmaceutical Research and Manufacturers of America. 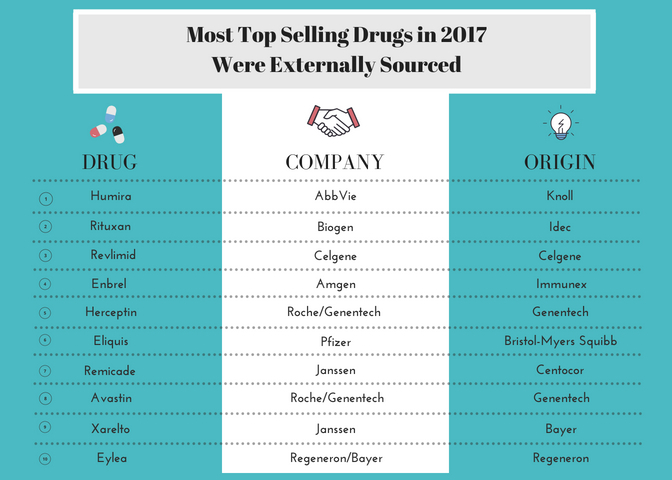 A look at the top 10 best selling medicines of 2017 illustrates that external innovation and open science have already made a tremendous difference in the biopharma industry. Eight of the 10 top selling biopharma products originated beyond the walls of the companies who sell them today, which indicates that open source innovation is an important trend worth watching. Without being tied to internal programs and upfront investments, open science allows Allergan and other companies to pursue the best new science and innovations, pull in the most promising ideas, and launch them at a faster pace than traditional models. “This allows us to be really nimble because we can flex from one project to another much more rapidly than you can if you’re doing all of this internally or alone,” Nicholson said. Not only are life-saving drugs and treatments brought to patients faster, but there’s a long-term shared value for partners and shareholders alike. Collaboration, strong partnerships, and smart business development are all key components of this new model and equally important as the discovery work. Once a new partnership is formed, the biopharmaceutical company that has acquired or in-licensed a new drug must then develop, get regulatory authority approval, manage manufacturing and control, and ultimately bring new therapies to market. According to Nicholson, there are two cultural prerequisites for the model to be successful — therapeutic area expertise necessary to identify the best opportunities and an absence of the “not invented here” mentality that can sometimes hinder implementation. The open source model has made significant inroads in forging new treatments in every area of drug development, particularly for neurodegenerative disorders, gene therapies, and novel molecular targets for cancer therapy. Allergan alone has more than 50 mid-to-late stage development programs across their four therapeutic areas. It is an ongoing cycle where replenishing the early, mid-, and late-stage pipeline is a consistent effort. During the first half of 2018, Allergan announced the results of seven promising clinical trials across five different development programs: ubrogepant and atogepant for migraine, cariprazine for bipolar depression, bimatoprost SR for glaucoma, and abicipar for age-related macular degeneration. Each of these programs was originally or in part sourced through external innovation. Additionally, the company received Fast Track designation from the U. S. Food and Drug Administration (FDA) for its oral, fast-acting investigational new treatment for major depressive disorder (MDD), another molecule sourced through open science. Open science undoubtedly plays a vital role in bringing life-saving and life-changing drugs, treatments, and therapies to those who need it most. The rate of science, technology, and medical innovation will only get faster, and the ecosystem from which to draw for drug discovery will only increase. [i] Schuhmacher A1, et. al. 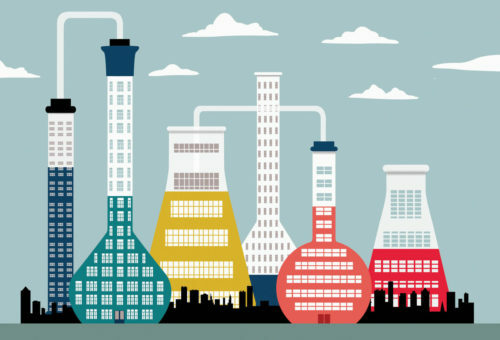 “Models for open innovation in the pharmaceutical industry.” Drug Discovery Today. December 2013.